Zuma’s brother, Michael, said the painting was disgusting and had brought nothing but disgrace to the family. “It’s the most disgusting thing that has ever been published or said about the president,” he said. The 1.85m-high painting entitled “The Spear” is part of Cape Town artists Brett Murray’s “Hail to the Thief II” exhibition at the Goodman Gallery in Johannesburg. Michael Zuma told the Sunday Times that as a family they are planning a meeting to discuss the matter as the picture had put everyone under a lot of stress. “I have been asking myself what kind of human being would do such a cruel and disrespectful thing about a president of the country and a father with little children,” Michael added. 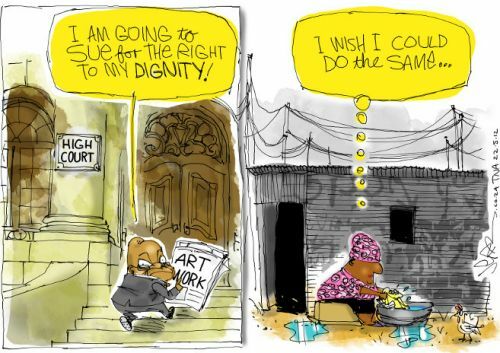 On Friday, the ANC launched an urgent court application in an attempt to stop the Goodman Gallery in Johannesburg and the City Press newspaper from displaying the painting. The hearing would be held at the High Court in Johannesburg on Tuesday, spokesman Jackson Mthembu said. The ANC earlier sent the gallery a lawyers’ letter demanding its removal, but gallery spokeswoman Lara Koseff said its lawyers had responded that it would stay until the show was over. The painting was widely condemned on Friday by, among others, Arts and Culture Minister Paul Mashatile, the presidency, the Congress of SA Trade Unions, the African Christian Democratic Party and the National Education, Health and Allied Workers’ Union.